The Moosey house and garden has always been home to multiple cats and a dog. Wild kittens have been rescued and socialised, with the lone canine (first Tajdog, then Rusty) accepting the furry newcomers without too much fuss. There's always a cat or dog willing to provide company when I'm gardening. A few non-furry animals are represented in the pages which follow - merino sheep, pet lambs, the hens, and just a few birds. A pig, with whom I became fascinated while on holiday, gets a mention, too. Fair enough! Escher, a German Pointer Chocolate Lab cross, is staying with us. But it was a little premature congratulating him on graduating to country dog status. Almost the next day he jumped three fences, his delighted nose discovering a long-deceased sheep at the bottom of the neighbour's rubbish pit. And did he take the slightest notice of me bellowing? It's time to meet and greet one of my youngest cats, Tiddles the tabby. 'Tiddles' is apparently a traditional cat name, suitable for either a large, benign, immobile moggy or a sweet little bundle of fluff. Oops. My Tiddles is neither of these. She's an athletic brown tabby with attitude. Miss Buster arrived as a sweet little black kitten at the end of 2014. Now she's a beautiful, laid-back, friendly cat. She sits on laps, smooches on beds, and loves to stretch out in the sun. Don't let all this lolling around fool you. Miss Buster leads a double life. Miss Buster is a spy! Since the tree damage, our side driveway has been open to next-door. So herding the sheep up and down it has been interesting. 'Think like a sheep' said Non-Gardening Partner, the chief herder. 'If you were a sheep, what would you think?' This is an oxymoron, right? Daughter of Moosey, still off adventuring in the big good world, keeps sending me photographs of cats she's met on her travels. She's now seen at least one replica of each of the Moosey cats, including several Little Mac kittens. It's rare day that I go gardening on my own - usually a furry friend (or two) tags along. This summer a mismatched trio are my constant gardening companions - a tiny black and white kitten, a large fluffy ginger cat, and a shaved border collie dog with a 'pouff' tail. Welcome to Little Mac, our new black and white kitten, the latest furry feline to 'find' Mooseys. In three weeks the kitten has gone from a far-too-small tiny creature to a strong and confident Size Four Kitten. At least Size Four! On my recent Ratoronga holiday I took an interest (not morbid, I assure you) in a large pig tethered alongside the Inland Road. The owners must have been puzzled by a pasty-skinned older woman turning up every day to take photographs. Was she planning a pig-heist? Sifter the tabby cat came to Mooseys in 1997, was given warmth, companionship, and great food, stayed as long as it suited him (about five years), and then wandered off. I've always felt I had 'unfinished business' with this cat - until now. This winter the house and garden have been quietly purring in a warm feline equilibrium - not surprising, when I've had the log-burner going so much. All the Moosey cats are behaving well, and obviously enjoying the in-house services. My pet lamb Stu (oops - he sounds like a casserole) lives in the ram paddock above the pond. Stu is an easy-care, chubby merino lamb - he drinks his bottle, eats grass, and snoozes in my old fashioned rose garden underneath the Omar Khayyam rose. Cats do tend to come and go at Mooseys. The coming is often a happy accident (finding a kitten in the woodshed), and the going is often inevitable (saying goodbye to little Mugsy). But the September 4th earthquake has caused rather a lot more coming and going than I like! September 2010, springtime at Mooseys, started off with an earthquake of magnitude 7.1 on the Richter scale, followed by lots and lots of aftershocks. Not the best time for young first-time ewes to have their lambs. On the third morning after the earthquake two abandoned new-borns needed rescuing. In the frosty depths of the mid-winter garden, one week before the shortest day, a pale ginger fluffy gardening cat is busy keeping the Moosey Head Gardener company. Forget the toasty warm pet-beds in the house - this cat is weatherproof. 2010 is the Year of the Tiger, so I thought I'd pay homage to Tiger the tortoiseshell, now the senior Moosey cat. Tiger, whose legs are too short and body too fat, and who is consequently on a 'Shape Up For Life' programme of exercise and diet. Lucky cat! When I write about my cats I see them as they are at the time - I don't think about them getting old and boring, or being any different. But cats do change. And sometimes they completely rearrange their lives. The Moosey animals enrich my every day in the house and the garden. And best of all - their stories and photographs are shared with others. My cats sometimes get more 'fan mail' than the Head Gardener does! Lilli-Puss, my young grey girlie cat, has always been cheekily called 'The Apprentice'. She lives upstairs with Jerome the Grey (at seventeen the oldest, slowest, living Moosey cat). So 'The Apprentice' needs no further explanation - oops! Rusty the Moosey dog is a hero. Rusty's wonderful dog-nose 'found' Minimus (a little wild grey kitten) in the woodshed, and saved her from the sad, scrappy life of a feral cat. Full, formal cat-name: Histeria the Tabby. Pet cat-name: Hissy. Why? Because she was the wildest, spittiest, growliest, hissiest kitten when she first came to Moosey's Country Garden. Gardening dogs the world over are deeply puzzled about this thing called 'ambience'. Rusty the red Border Collie at Mooseys often thinks that the alpha-male of his pack (an older-lady gardener) has gone ambiently barmy. Ginger Percy, the last of the Wild Cat Colony kittens, came to Mooseys to be fostered and socialised. He was about twelve weeks old and had never been handled. Percy started life as a feral kitten, living under a pine hedge in a horse paddock. Living in a house with eight cats and a dog, sometimes things are bound to go wrong. Here's my rogues gallery of the worst Moosey animal offenders. Oops - some content may offend the shy reader. My garden's a bit static and colourless in winter - there's nothing much of the vegetable state to take photographs of. That's why I like winter-touring with my camera and my cats (oops - nearly forgot - and the dog). 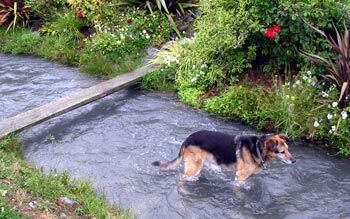 A river is the perfect playground for dogs to practice fetching things from water. Some dogs are lucky enough to have their own familiar chasing object, brought from home. Here are some dog-etiquette tips for chasing a tennis ball. Haru my pet merino lamb was born in the spring of 2006. Just over one year later she's off with the other sheep in the flock to be shorn. This is a big day - definitely a sheep's coming-of-age - Haru's first shearing. Ginger cats make brilliant gardening cats. The newest ginger Moosey cat, Percy, is carrying on this proud tradition, started many years ago with old Ginger Puss, and carried on by Fluff-Fluff and dear Smoocher. I'm feeling quite sad! I've just finished my four week term fostering three little kittens - Hissy, Percy, and Lilli-Puss. They arrived here frightened and semi-wild, and are leaving smoochy and sociable. My kitten fostering has been a success! I'm playing a very small part in my friend Judith's Trap-Neuter-Return programme, helping her manage a feral cat colony. Already I can sense some progress, and I'd like to share some small stories. Animal shelters in the city do great work, taking in abandoned cats and dogs. In my city there's an underclass of feral cats, often living on wasteland at the edge of the suburbs. I've even made my own small, though thankfully neutered, contribution! Fluff-Fluff - my gentle, fluffy, pale ginger cat with the amber eyes and the silly name - this is your own adult cat page! Welcome to the Moosey pets section. At the end of the year 2006 two Christmas kittens joined Mooseys Country Garden, injecting some youth into the resident cat community. One was almost pure white, with staring goggle eyes and a scabby face. Family portraits in the animal kingdom are usually just 'mother and child' - sorry, fathers, but you don't usually get in the picture! Our small group of beautiful merino lambs each has an especially caring mother. Dogs do unmentionable things. Sometimes? Often? In the house? In the garden? If there were demerit points for dog misdemeanours Rusty the red Border Collie would be well and truly disqualified! Once bitten twice shy? Or should that read 'Once pecked twice as wise'? The new hens and rooster at Mooseys have a fiercely organised routine - and they love it! Charles the merino ram came to Mooseys Animal Farm in March, 2006. We run a small flock of merino sheep, concentrating on fine wool production, and we wanted our own super-fine ram. The basic physical shape of a Samoan cat is very different to my own cats. They are narrow and light, with long bodies, slim long legs - like cat-walk models, compared to the lumpy, fluffy fatties who live with me in my house and garden! The two youngest Moosey cats, Fluff-Fluff and Beige Puss, are fast becoming my best all-weather, four-seasons gardening cats. And such stamina! They keep me company from dawn until dusk. A travelling garden reporter in summery England has a great life - zooming through the countryside on trains and buses, visiting new gardens, making new gardening friends, experiencing the (wet) English weather. What could be more heart-and-mind-warming? It - that is the MVC, or Most Valuable cat Competition - all started as a competition between cats and honorary cats (the Moosey dog), something to do over the giddy summer holiday weeks, when the gardening weather became too hot to handle. It's a serious business, getting the right Christmas present for a stylish red border collie dog. Bones just get buried, and toy squeaking ducks are very un-PC. How about a designer kitten? The perfect present! Rusty the Red Border Collie - it's well time you got your own dog-page! You're over a year old, and we still call you a puppy! Fred the pet lamb has come to live at Moosey Animal Farm. Fred is a Romney, with large ears and a large 'cute factor'. He's a pretty lamb - I'm sure this rather girlie adjective won't upset Fred's self-sheep-esteem. Mid-spring is an exciting time on Moosey Animal Farm. Exciting, that is, for the small flock of merino sheep - it's shearing time! Most Valuable Pet Contestants earn 10 bonus points every time they get a mention or a photo in another website or blog. Tiger the cat came to Moosey's Country Garden as a Christmas 2005 kitten with her brother Smoocher. The two newcomers soon named themselves - as soon as she settled in this little striped tabby female turned into a wee tiger! The Most Valuable Pet competition features a sophisticated pet scoring system, with contestants competing for Most Valuable Pet Points in 6 separate categories. Vote for your favourite Moosey animal every day and help decide the MVP. Smoocher the ginger cat came to Moosey's Country Garden in December 2004 with his sister - two small squeaking six week old Christmas kittens. She was content to sit, and squeak, and look cute. He was definitely a kitten on the move. It's some weeks now since the new 2005 Moosey animals (two kittens and a puppy) arrived. Pet owners will understand that animal equilibrium in the household is a delicate matter. The Most Valuable Cat Competition, or MVC for short, is a traditional summer animal contest. It is enjoying a revival this summer (2004 - 2005), as new Moosey animal arrivals give it new life. I promised myself I would never do this - try to write from the mind of one of the Moosey pets. It's - well - just too silly. But the temptation is too great - there's not much going on apart from the antics of the visiting rooster and hens. A month in the life of a Moosey animal is exciting and action packed. What will the cats & dogs get up to this March, 2004? If you look very carefully in our pantry behind the flour and sugar, you'll spy a small pile of library books. Why are they hidden in here? Has the Moosey household got even madder? Taj-dog is getting old. He has been our house dog for many years now, and has spent most of his life enjoying the country ambience of Moosey's Country Garden. It's Saturday afternoon and I'm building another purposeful path through my garden. I am a compulsive path edger, and today I need more stones. Taj-dog needs his weekly wash. We both need to visit THE RIVER. My Most Valuable Cat Competition for the summer of 2001 - 2002 has been a complete flop. The prize tins of gourmet cat food are still stacked on the pantry shelf. Pets and people can develop quirky relationships. The house pets at Mooseys are definitely creatures of quirky habits. Consider the vital cat question of the best sleeping spot. The sun is extremely inconsiderate to snoozing cats, moving across the sky during the day. We keep about 20 to 25 sheep on the property - the number varies from year to year. The sheep act as automatic four legged lawnmovers and provide entertainment in the spring by producing a new crop of lambs. Jeremy was Non-Gardening Partner's black and white fluffy cat. It's hard to describe Jeremy without insulting her, for she was always a bit of a pathetic cat, timid, and frightened of her shadow. Yet she was a silly smoochy cat too, and extremely loyal. Big Fat Sifter is our biggest cat, a large brown tabby. He came to us merely a medium-sized cat. In fact he was lucky to come to us at all. Slow Puss was one of our earliest cats. He never had the chance to live here at Moosey's country garden. Stumpy is a small grey female tabby cat, one of two sisters. She is named after the middle stump-camera at the cricket, which one T.V. commentator affectionately called 'Stumpy'. Taj-dog is a simple sort of dog. His happiness depends totally on four words - bunny, walk, car and river.